The history of P22, like all history, is filled with a mix of myth, fact, conjecture and legend. The first 10 years of P22 type foundry (1994-2004) have transpired with their share of highs and lows and a legacy filled with many digital fonts and other fine things. 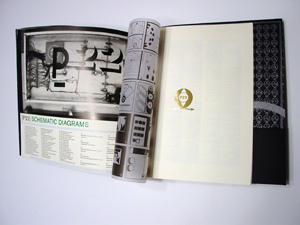 This book will in no way give a concise history of P22 type foundry, but rather a lush view into a few select projects and details of the vast P22 empire. Divided into three distinct sections, this book requires interaction from the reader. Completely visual, this section features a barrage of design elements that begin with items of inspiration for various P22 projects. 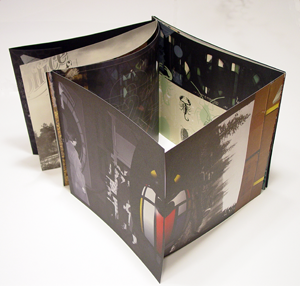 It flows through a double fold out section to a culmination of finished projects. Five diptych spreads feature photographs by Eric Frick. 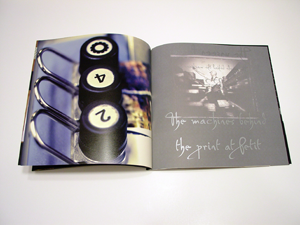 A detail of printing machinery in action is paired with semi-fictional portraits of the five principal members of the P22 company. In complete contrast to Section 1 and Section 2, Section 3 is text only and gives the reader the stories behind much of the imagery seen in the previous sections of the book. 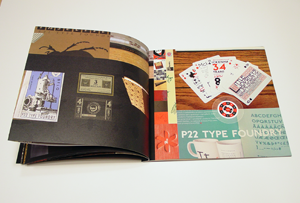 Detailed production notes give further insight into the book and its making.The overall effect is a slightly surreal coffee table book with a heaping helping of self-deprecating humor and some genuine insight into the workings of P22 type foundry. We could go on and describe more details of the book, but suffice to say it is epic. 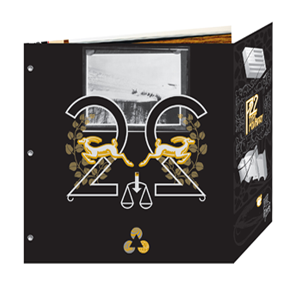 OK, perhaps not that epic, but the physical attributes are: 10” x 10” in size, about 36 pages, 6 different kinds of paper, metallic inks, die cutting, foil stamping, debossing, varnish overprints, translucent sheets, grommet binding and rare photographic evidence of the elusive staff of P22 in their natural habitat. 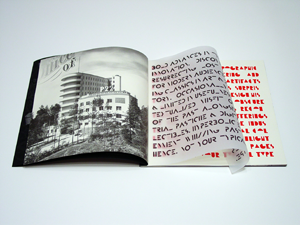 Produced as a limited edition (in collaboration with Mohawk Paper, Eric Frick Photography, and Petit Printing) of 2500 copies with 500 set aside for sale. Surely never to be reprinted.